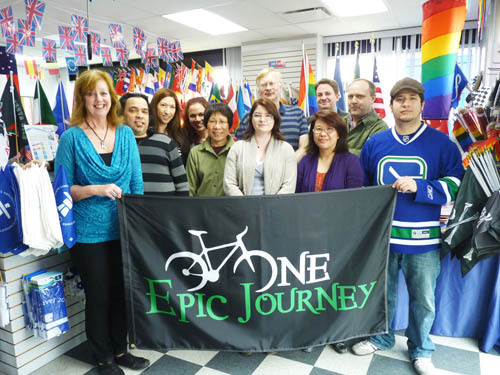 We are excited to show off the flag we have donated to the One Epic Journey team who are doing the 2012 Ride to Conquer Cancer that goes from Vancouver to Seattle in June. Team captain Bill deGroot got some of the staff to pose with the flag before it left the building. One Epic Journey will be carrying the flag across the start and finish lines of the event as well as flying it at their campsite between legs. They have just passed the $20k mark in fundraising, and their ultimate goal is $25k which I am sure they will reach. We wish them the best of luck on the ride!